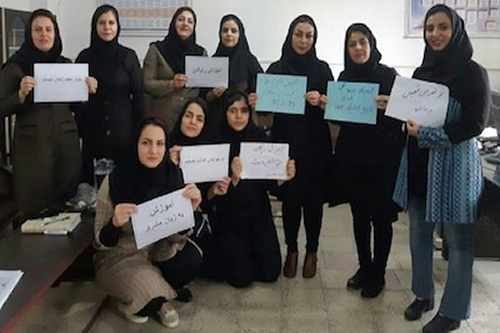 Iranian teachers and education workers continue to face severe repression for peacefully defending their rights and freedoms. At least 15 teachers were arrested and many others were summoned for questioning or threatened by the security services for their participation in a two-day peaceful strike action called by the Coordination Council of Iranian Teacher Trade Associations (CCITTA) in many cities across Iran on 13-14 November 2018. A similar nationwide teachers' strike on 14-15 October already resulted in the arrests of teacher activists. Teachers were demanding decent wages, free quality education for all and the right to form and join independent workers' organisations. They were also requesting the release of all teachers already detained for defending their rights. LabourStart in partnership with the Education International have launched a campaign calling upon the Iranian authorities to stop the persecution and criminalisation of teacher rights activists and independent unionists.